sightseeing, where better to stop for coffee than the Café Van Gogh? Immortalized in Van Gogh’s famous work ‘Café Terrace at Night’, painted in 1888, the lively café stands at the corner of the central Place du Forum and draws a steady stream of tourists to its now-iconic terrace. carefully restored to maintain its original layout. Head there in the early morning to avoid the crowds, soak up the buzzing atmosphere at lunch time, or visit after dark for the ultimate Van Gogh-inspired photograph. 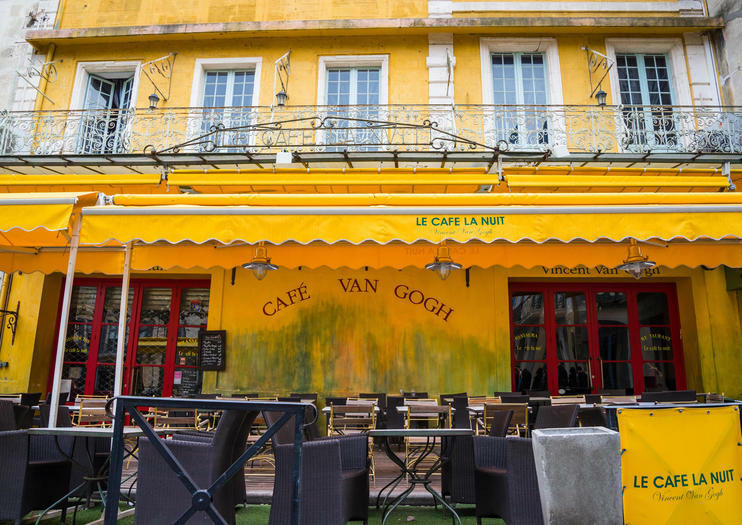 Café Van Gogh is located on Place du Forum in central Arles and is open daily from 9am to midnight. After crossing the Provencal countryside, your guide will take you to the Langlois bridge painted by Van Gogh for a photo stop.You will then join the city center of Arles.During the tour you will see the Van Gogh café, the Van Gogh Hospital and many other places where Van Gogh's paintings are on display.Arles is also a UNESCO World Heritage Site. Your guide will take you to the 2,000-year-old Roman theater and amphitheater still in use today. Get a taste of Provence on this full-day small-group tour from Marseille and discover its picturesque hilltop villages, magnificent Roman ruins, and legendary artists. Explore historic Arles, follow in the footsteps of Van Gogh in Saint-Remy de Provence, and visit the famous Carrières de Lumières in Baux de Provence. Walk in the footsteps of one of the great artists of the 19th-century on this Van Gogh-inspired half-day small-group tour of Provence from Avignon. Explore the ancient Roman ruins and rural landscapes painted by Van Gogh in Saint Rémy de Provence, enjoy the views from Les Baux de Provence, and visit the Van Gogh Cafe and hospital in Arles.